Ashley's Antics: Molly & Jason-- What? What? 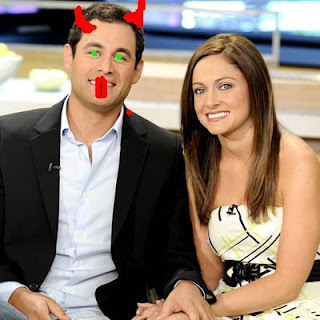 Let's be honest-- Jason Mesnick is a total D-BAG. For some reason sweet, cute Molly fell for his antics. I don't get it- he's kind of a tool, he's not that cute and he has plenty of baggage-- but, to each their own. What is with the god awful tie that Jason picked out for his wedding wear?